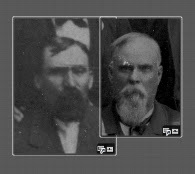 I couldn't help trying to match up as many faces as I could between the two different group shots of Civil War soldiers. Here are the matches I came up with. Are they all correct? 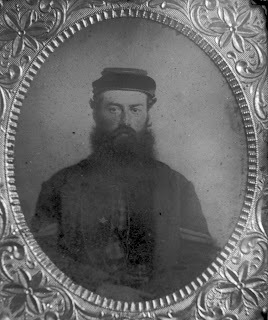 Among the loose black and white prints I found a set of re-photographed Civil War pictures. They are kind of fuzzy and dark, but a little cleanup can restore the contrast wonderfully. I don't know who took them or where the original photographs were found. 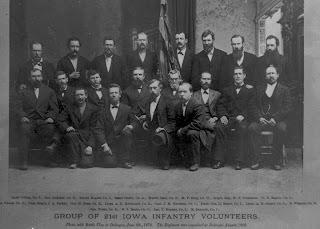 First, here is a picture captioned "Group of 21st Iowa Infantry Volunteers." The fine print reads "Photo with Battle Flag at Dubuque, June 4, 1879. 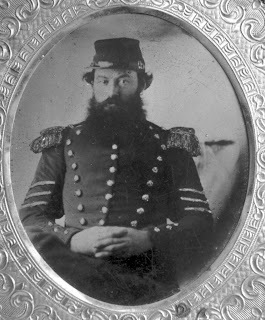 The Regiment was organized at Dubuque August, 1862." The man in the upper right appears to be W. E. Bagley, Company C. I think he must be Dora Bagley's father, or my great great grandfather on Richard Armstrong's side. There were also are some additional photographs of portraits. I presume there was some evidence that they were of the same man, but I don't have any documentation to back that up. Here are the portraits of the man who might be W. E. Bagley. 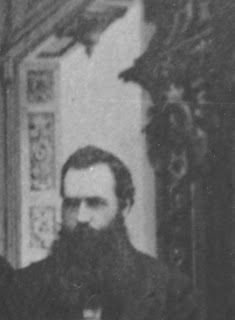 I'd guess these were taken closer to 1862 than to 1879, but I don't have an exact date. 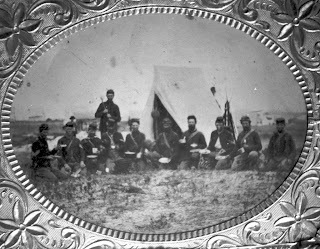 Here is a group shot taken in camp, presumably within a few years of 1862. It is unfortunately pretty blurry. 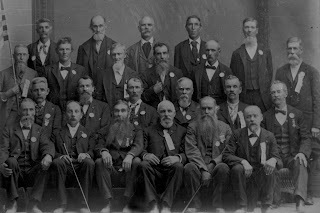 And last, another group shot, undated but perhaps taken a decade or so later than the other group portrait, maybe around 1889. It seems to show most of the soldiers in the first group shot. I've again zoomed in on the man I think might be W. E. Bagley. 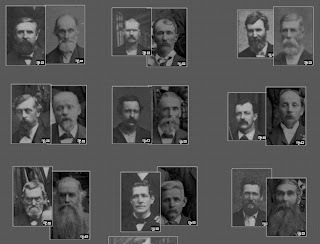 I chose this one in part by a process of elimination; I was able to pair up most of the men to a fairly high degree of certainty with their images in the earlier group portrait. But it is hard to be certain when the portraits were taken years apart, and so much of his face was covered by hair! 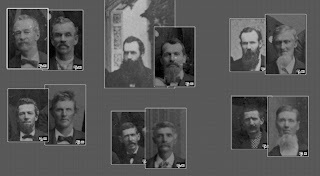 The second man from the right in the bottom row is also a possibility. 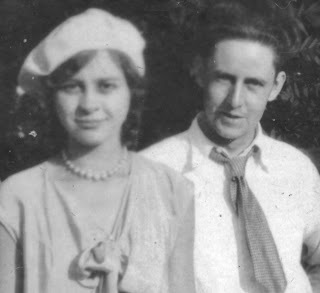 I will keep a sharp eye out for any further information about W. E. Bagley. It seems unbelievable to have both Revolutionary War and Civil War soldiers in my ancestry! More pictures from the piles I've been scanning. 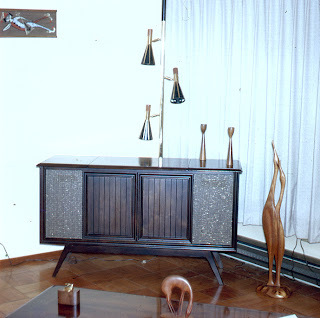 These are from my grandfather Richard's side of the family. Unfortunately they aren't very clear, but I'll do what I can. 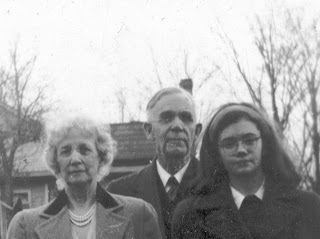 First off is a snapshot of Richard Armstrong with his parents in Granger, Iowa. 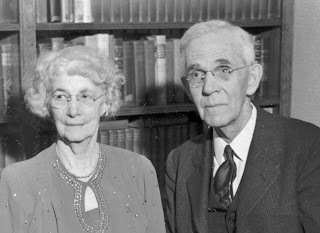 Dennis and Dora Armstrong are on the right, Richard is in the middle, and on his left is his sister Ruth Armstrong. 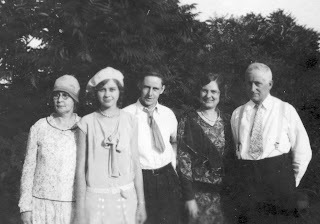 The woman on the far left is unknown. My grandmother's caption read "Ella Grace?" but this was then crossed out. It definitely isn't her, but that means we have another mystery -- who is the woman on the left? Next, a couple of close-ups of the picture above. Ruth Armstrong was quite a looker! Finally, another picture of Dennis Armstrong. I have a couple more but none of them are very good photographs, unfortunately. 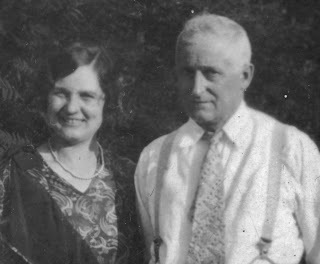 Here are some of the sharper pictures from a pile of loose pictures of Isabel, Henry, and family. 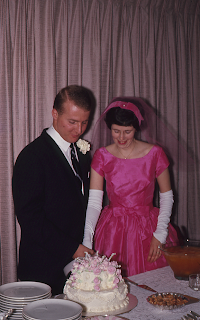 Here are Isabel and Henry from their 50th wedding anniversary. 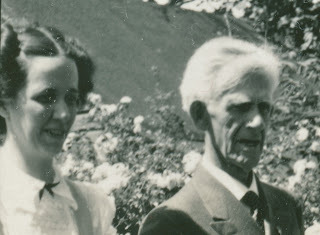 This is a detail from what is probably the clearest photo I have of the two of them. In the collection I also have an invitation to their wedding, circa 1901, if I recall correctly, and the guest book which includes the guests from the 50th anniversary party. Here is another shot of the somewhat mysterious Uncle Will! I set aside the slides for a while, because they are proving too difficult to work on with Aperture. Meanwhile, I have a mountain of older black and white prints to go through. 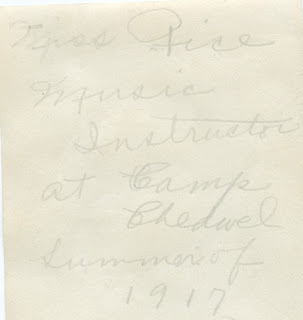 The caption, written in white ink on the black paper, is quite difficult to read, but it says "Miss Rice at Camp" and "Music Instructor." And this is one of the more legible captions. Some of them are nearly impossible to read. In some cases, the pictures are already nearly falling off the black paper, but bits of the paper are securely stuck to the photo. After scanning the photo, I pulled it off the paper, which brought some of the black paper with it. I decided to take a chance and try soaking off the black paper residue. In fact, it comes off very easily. The picture dried nicely with no apparent damage. Now I can see what the back of the picture says! 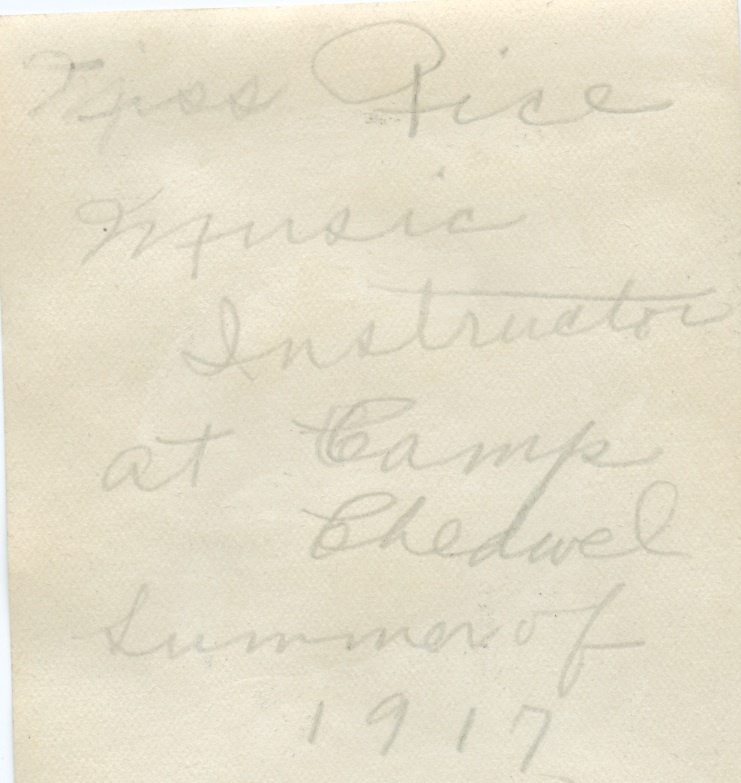 Miss Rice, Music Instructor at Camp Chedwel, Summer of 1917. I may try this technique with the rest of this batch of loose, disintegrating album pages. That way I'll have a high-resolution digital image, a scan of any annotations on the album pages, and a scan of any hidden annotations on the backs of the original photos. 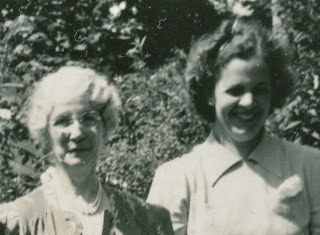 I came across the text of a talk that my mother must have written for her work at Fircrest in Seattle. I have no idea if she ever gave the talk or not. This would have been about 1964, I think. I scanned the cards with the typewritten text on them and fed them to an OCR program. I did a quick run-through to fix a few typos and OCR errors, and here it is. 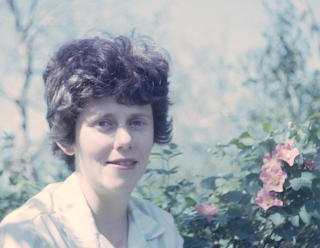 I had nearly forgotten that my mother was quite a decent writer, especially when she had something to write about that she was passionate about. 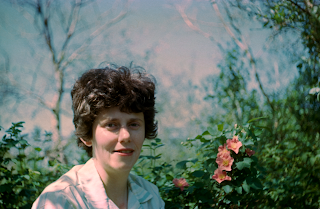 I did not really get into writing to emulate her, because I rarely saw her write very much except for short personal letters, but she did always read my essays and make suggestions. Some of the text seems a little bit politically incorrect by modern standards (I don't think the word "retardate" is used anymore to describe a mentally retarded person). But I found it quite interesting, even somewhat radical and fiery. Some of her language was deliberately targeted to get people out of their complacent attitudes. 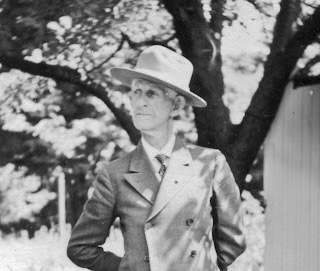 It was especially interesting that she was quite critical of the usefulness of her own field, occupational therapy, and in this essay makes a strong case that traditional OT techniques, and even ways of thinking about how to help people, were completely useless in the job she found herself doing. That's the attitude of a young person who wants to make a difference. I had always thought of her as someone who was on the more conservative side of culture in the 1960s, but this talk tells a different story. "Radical" is not a word I usually associate with my mother. It occurs to me that had I known more about her life and career, and been in less of a state of shock at her abrupt illness and death, I could have given her a much better eulogy by talking about her values and the things she worked for. I can't go back to her funeral and rewrite the eulogy, so consider this an appendix. I don't know just how extensive my mother's role was in the program she described. Did she conceive and set up the whole thing? It does give me an interesting flavor of the work she was doing before I was born, which I didn't really know very much about. I know she also worked in a tuberculosis sanitarium in the early 1960s, and there was still evidence visible on a chest x-ray of her exposure to TB. 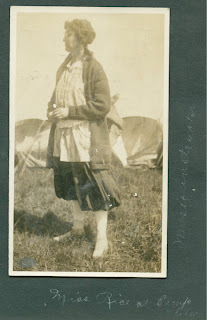 I might reconsider and include some of the photographs from her talk now that I know what it was all about. Privacy concerns just may not be that important after over forty years have passed and the residents of Fircrest are probably already a matter of public record, given that it was a state institution. Fircrest School is the newest of four state supported institutions for the care of the mentally retarded in Washington. The residents are classified as severely and moderately retarded. There are some who are sometimes called "human vegetables" and require complete physical care; there are the active children who are being trained in self-help and motor activities; and then there are the adults who are capable of caring for their own physical needs and can do simple jobs under supervision. It is this last group that we will be concerned with today* These men and women vary in age from 21 to 71 and coincidentally their I.Q. is from 20 to 70. A person in an institution for the mentally retarded has been placed there because he was unable to cope with the world outside -- and for various reasons he has been rejected by his community. This community has found it more and more difficult to cope with this handicap in the last several decades due to such social changes as increased occupational and residential mobility. Just as one finds fewer grandparents in the homes of their children, our increasingly socialistic world finds more efficient and maybe better ways of dealing with its non-productive people. Despite the new very much in vogue interest in mental retardation sparked by the late John F. Kennedy, the actual tolerance levels for the presence of very oddly formed, mumbling or non-verbal, drooling, and maybe limping people has probably increased very little. We pay our taxes and establish reservations for our community eyesores. Yet after we have deported these human beings our task has only begun. We have assigned the responsibility for their every need in their very limited environment to employees of the state. Only in very recent years has it become the policy to utilize professional personnel and attitudes in the lives of these people. The employment of occupational therapists in Washington institutions for the retarded has less then a ten year history. The factual account of the process by which a person ends up in an institution need not be a cynical account. The difference between the expectation levels of the community and the functioning capacities of the retardate is so vast that the handicapped person suffers from the knowledge that he is a second class citizen. The community is not his community. Its pace is not his. Its activities preclude him. He often realizes that he is an impediment to someone's standard of living. The establishment of institutions has in many ways been a humane process. It has been a way of instituting a community within a community. The retardate now lives in a community designed to fit his needs -- a community where there are no pressures to function above his ability, where he need not feel he cannot keep up. Here he can feel secure and here he can be an important person. What we as occupational therapists need to do for these people is to help them to function better within this sub-community. It is important to help them to develop a meaningful life and to help them to interact with each other more effectively. They must gain a feeling of natural interaction. This feeling of natural interaction can only stem from a need - like the need to cooperate effectively to complete a worthwhile project. We could offer him high hopes in the use of traditional O.T. projects but he would soon realize the senselessness of his effort. What could he do with his looper pot holder when it was finished? His family has lost interest in him so there is no one to present it to as a gift. It is probably not made well enough to sell to a staff member. Why should he make another one? When I came to Fircrest five years ago the larger part of O.T. time was spent doing tasks that were generally designed for people of normal intelligence suffering from a temporary disability. 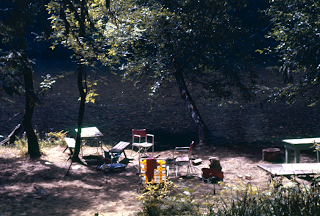 These projects were another useless vestige of the values of the larger community. It became obvious to me that the world of the retardate was one that I was unprepared to deal with. An appropriate approach needed to be developed. In the time it takes one retarded person to complete one looper pot-holder five more retarded people have been born in the city of Seattle. At Fircrest there are three occupational therapists and two handicraft workers in the midst of a community of 1,000 retardates. Net only have the old techniques been inappropriate to the needs of individuals but they have been grossly inefficient in the face of the real problem of numbers. We therapists were able to work with a few who had special problems in behavior, in self-help, in coordination, etc., but what about the several hundred residents needing only that feeling of being important? In keeping with the general trend of all of the medical and psychological services, occupational therapy can fit very smoothly into the treatment of large groups. When I came to Fircrest a small group had already been established with the name of Sheltered Workshop. 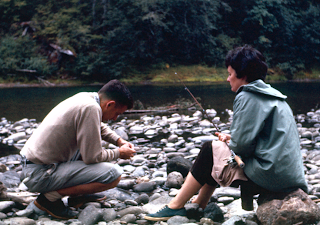 Soon after this time in 1962 an opportunity came to us that was to change the lives and the personal outlook of many Fircrest residents. The owner of a small candy packing company offered us the opportunity to assemble the Easter baskets which would be sold under his company's name on the open market. Through the cooperation of the administration we appropriated a large empty building on the edge of Fircrest grounds. Because of the newness of these pioneering ventures involving the cooperation of business and treatment people there were no precedents to follow in establishing a working division of labor. The problems were many and complex. They involved the coordination of logistic operations between Seattle and Hong Kong, Formosa, Tokyo, Switzerland, Mexico and Panama. Truckloads of baskets, artificial grass, marshmallow eggs, chocolate bunnies, cellophane bags, unassembled cartons, etc. began to arrive. You can imagine the excitement among the residents as the building was made ready for use. We were in the manufacturing business and had to start thinking like industrial people. We decided to use the assembly line method whereby each person would perform one task as his contribution to the finished product. This involved my having to divide the complex operation into small manageable task units. Once I had made these divisions I was ready to decide which residents could be most fitted to and could benefit most from each task. As you can imagine, the limitations suffered by these people are many and great and the process of selection involved a great deal of knowledge of each individual. This knowledge was not at our fingertips however and we had to call for the help of all those who knew the residents. Thus we depended very heavily on the cooperation of the administration and the non-professional living supervisors in our project. This opened new lines of communication and made the Easter basket project a Fircrest-wide endeavor. By getting everyone involved this became not only a high-priority project among the staff but a high-prestige project among the residents. Everyone hoped to be chosen for the project and many who had previously spent their whole day watching television or roaming around the grounds now enjoyed a new feeling of importance and status. The resident workers were graded according to their ability and were assigned a pay scale commensurate to how much they could produce. There is much talk lately about dehumanization in institutions as compared to some abstract thing called human dignity. After hearing these discussions out it seems that human dignity boils down to a state of personal independence. In the midst of an environment geared to the mass treatment of large groups of state dependents there are few things which give a person a feeling of individual freedom like having a pocketful of spending money which they themselves have earned. Even though most of the residents cannot tell a penny from a quarter they are somehow aware that they are earning a measure of power. When I state that we make Easter baskets some of you may have images of people sitting around weaving baskets and maybe packaging the candy. What we actually do is take ready-made baskets and roll newspapers as filler, then lay on a thin layer of artificial grass, then tape on pre-packaged candy Easter eggs, then tape on various chocolate Easter bunnies and candy bars, put a label on the bottom, then place them in a cellophane bag or wrap them with colored cellophane, tie on an artificial flower or bow which we make on the bow machine, put it in a carton along with the correct number of other baskets just like it and put the carton in the right pile to be counted and shipped. We divided the workers into two groups -- one meeting in the morning, the other in the afternoon. The morning group prepared the baskets for the afternoon group by filling them with papers and applying the grass and then left them at the head of the afternoon assembly line. As you can see these two tasks require quite a bit of judgment and for many of the retardates it took a considerable amount of training. The majority of the morning workers were people with mongolism. They are especially good at gross operations requiring little in the way of delicate dexterity. They form habits easily and this learned behavior was remembered from year to year. There were several workers who were only capable of carrying baskets from one point on the assembly line to another. They were still paid and received satisfaction for their part in this job. The afternoon session required more of a traditional assembly line procedure. The workers performed their one small task as the baskets were handed down the table from station to station. It was necessary to keep a sharp eye on quality control because if a person made a mistake in his job he would generally repeat this mistake on the next 500 baskets without recognizing his own error. At the end of the assembly line we used one severely cerebral palsied wheelchair-bound man who could not perform any of the physical tasks but who could count. He took a great deal of pride in always being accurate and would remember for three hours exactly how many baskets had been boxed. The baskets were then carried to the storage area to await shipping. Apart from the details of the basket making per se the job of the therapist involved much in the way of supervising and encouraging interaction and discussion among the workers. Many arguments arise between these people who live so closely together. Any kind of friction interrupted the working rhythm and upset the rest of the group. 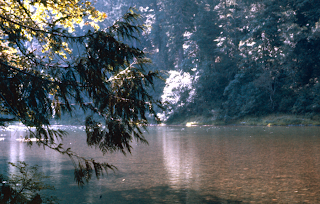 Many of the residents were chosen because of their inability to cooperate. Others have problems of withdrawal and the necessity of interaction did much to help them relate more effectively. The project lasted three months and in this time many new acquaintances and associations were made which carried on the year around. The workshop was an excellent opportunity to teach many of the values which are so crucial to smooth and effective group life. We stressed promptness by using a sign-in system. Personal cleanliness was necessary. The temptation to steal candy and the personal belongings of others was an ongoing opportunity to stress honesty and mutual trust. We developed a policy of paying the residents every three weeks. The first year the pay rates were 5, 10 and 15 cents an hour, paid according to how well the resident worked up to his capabilities. The pay has been raised each year and this past year went as high as 40 cents an hour for a few. A few of the residents are wise enough in the ways of the world to save their money until they have enough to buy something they want such as a watch, an electric coffee maker, a coat or dress, or even a used typewriter. Receiving money for work was a unique experience for many of the residents. It was certainly a motivating force and had much to do with attracting and sustaining attention and interest in the project. 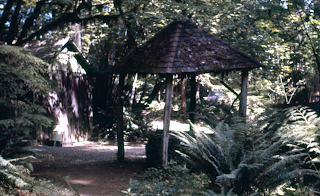 The company paid for the work by the piece -- paying 5 cents each for the completion of small baskets, small sand pails and cowboy hats, 10 cents each for medium sized baskets and large sand pails and 15 cents each for large and extra large baskets. The Easter Basket Workshop has now been in operation three months a year for five years. Our goal the first year was to make 18,000 baskets. Since then this number has increased to 25,000. The workshop is anticipated by the residents for many months before it is to start each year. 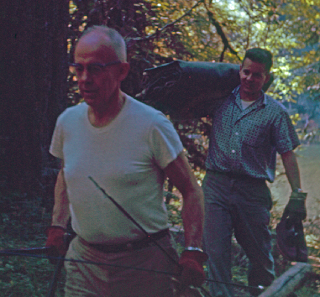 Each year new residents are given a chance to work. This year 143 people worked on the project. Those who have participated each year have become experts in the work. Each year they become more proficient and less supervision is necessary. Many are now able to recognize their own mistakes and correct them. Some have even learned to take being corrected without becoming immediately defensive. The Fircrest workshop has also had contracts for some other one-time projects such as placing price tags on plastic flowers for an import company and sticking a Koroseal label on 150,000 advertising leaflets to go into a magazine. It is our hope that a year-round Sheltered Workshop will eventually be established at Fircrest. Sheltered workshops do present several important questions to the therapist. Does the venture into the business field detract significantly from the therapeutic aspect? And is the large group technique a significantly more efficient therapeutic device than a one to one therapist-patient relationship? The answer to either of these questions will be in terms of a compromise but there are several facts which present realistic arguments for the group technique. With ever-expanding institutional populations and with increasingly more sensitive diagnostic techniques the need for effective O.T. practitioners indicates to us that we must consider sacrificing our preconceptions of tidy Ivory-tower therapeutic relationships in the face of the real problem. 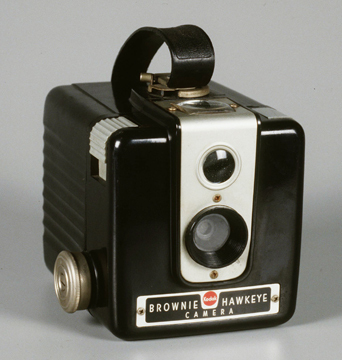 My first camera was a Brownie Hawkeye. 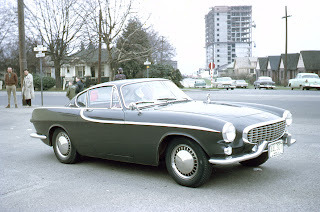 It was old at the time (the late 1970s). I must have taken quite a few pictures with it; I wonder what became of them? These slides are all mixed up, so I've been trying to sort them into the original batches. I can only do this when I can find some distinguishing mark on the slides themselves, or by the images. 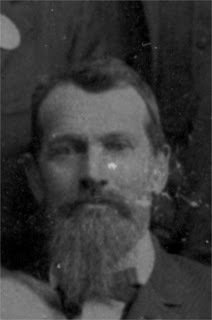 I'm pretty sure this is H. Harrison Clarke, Marcella Armstrong's brother. Now that I have the batch put back, though, I can make sense of some of the people I didn't recognize at first. When I get through the rest of the slides, I'll go back and try to identify everyone. 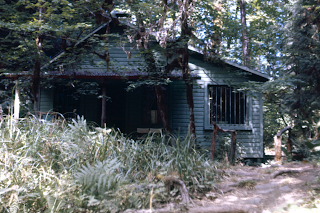 This shot is from a box of very clean and undamaged but faded slides marked July 1965. It looks like they may have been taken on an Armstrong family camping trip to the Canadian side of Niagara Falls. 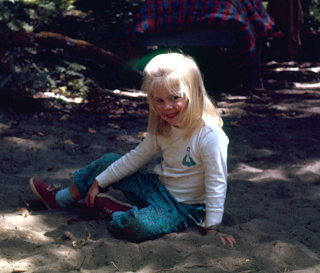 These slides are 3M "Dynachrome" film, which I've never heard of -- probably because it wasn't very good! I kept thinking I had the skin tone wrong, because her cheeks look pink. Then I realized she actually has a bit of a sunburn in this photo! You can see at the base of her neck that she must have been outdoors too long. I think this is a great picture; it shows a Susan who has the beauty of her youth but at the same time the graying hair and laugh lines that hint at the older Susan. It has an ageless quality, just like she did. It is how I remember her. Who took this photo? 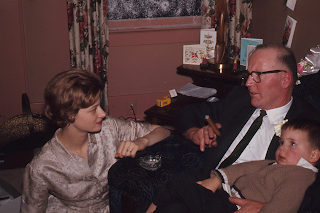 It was probably either my grandfather, Richard Armstrong, or my father, Richard Potts. I think both of them were on that trip. It is hard to know how carefully staged and planned the shot was; it could have been relatively spontaneous. Some of my best shots show up without planning. I could try to make the colors in the shot more "accurate," but this shot looks like it was taken in late-afternoon sun, perhaps even opposite a sunset, in a partially shaded environment, with a lot of reflected or filtered light. It's hard to know just what "accurate" would mean. But I kind of like the colors the way I have them here. It reminds me of one of my favorite photos of Veronica here. That shot initially appears to be way too yellow, but the color is accurate; it was taken on late summer afternoon and the light had that same quality to the naked eye. Interestingly, I was just looking at some of the work of a photographer who buys up expired slide stock for the express purposes of getting interesting effects like this. And some photographers (including my friend Art) have long been exploring the "low fi" effects available by using inexpensive digital cameras and the various striking, but inaccurate, images that they produce. This isn't the greatest image, because I had to enhance the brightness a great deal and that brought out some scanning artifacts. 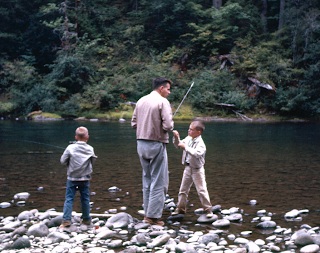 But it shows my father around 1967. I am not sure what he is doing -- maybe attaching a boat to a car? The original is very dark; I think it was shot at dusk, or before a storm. 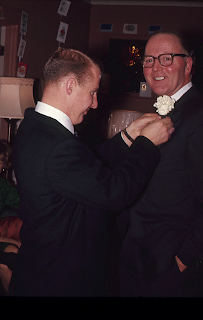 My father was (and still is) quite a handome guy! Unfortunately I only got a small portion of his good looks. 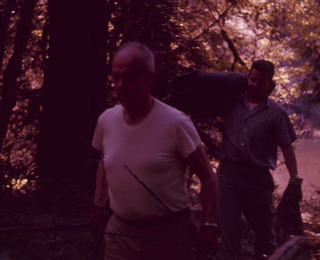 These shots are from a box of slides stamped March 1963. I assume they are scenes from her life with the man she was briefly married to, Ted Rose, but I don't know much at all about that period in her life. 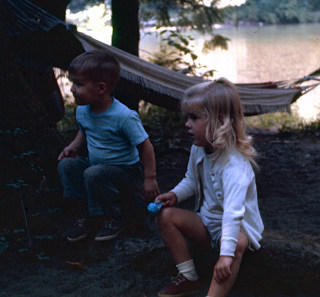 These slides are in poor condition and I have not done much to restore them. There's a slide that appears to show some guys sitting around a kitchen table, maybe for a poker night. 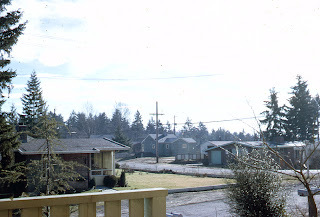 The box of slides had an address label made out in my mother's printing: Susan Rose, 12009 33rd NE, Seattle 55, Washington. I'm not sure what the significance of the "55" was. Does this picture show that address? 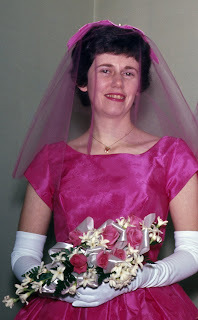 Another wonderful shot of my mom in her wedding dress. I have a set of slides that appear to show a group of mentally retarded adults. They are creating really pretty Easter baskets. I'm assuming my mom was working as an Occupational Therapist with this group. 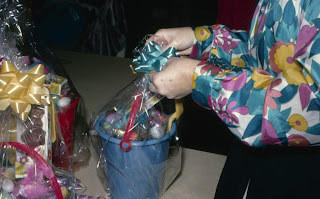 I'm not going to post any of these pictures of the people, because of privacy concerns, but I wanted to include a shot of the Easter baskets to show how colorful these slides are. I did a little bit of tone correction, but for the most part they don't need much. These pictures look like they have never been projected! The slides are stamped April 1967. I'm cleaning and re-scanning slides. The slides are of all different types. 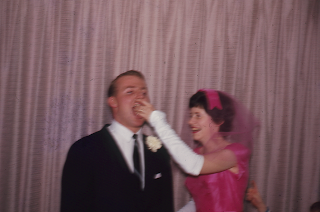 The wedding pictures are Ektachrome, and seem to have aged quite well, although some of them have mildew spots. I wiped them with a "tiger cloth" (anti-static micro-fiber cloth) and PEC-12 emulsion cleaner; this did nothing for the mildew spots, but did remove some dust and dirt. It seems impossible to get everything off the slides, so some of it inevitably gets scanned. Digital ICE works on the Ektachrome slides, and removes some of the dust spots, but does not work on the Kodachrome slides. I've also been experimenting with post-processing to improve the color, and making 300 dpi versions of the images for printing on my inkjet. The results are pretty good, now that I'm using Adobe RGB and a monitor profile for proofing. Some of these will be going out as Christmas gifts. Color pictures look pretty good on my old HP Business Inkjet 1100, although it does a poor job rendering blacks. I'm eventually hoping to replace it with an Epson R2400, which uses three different black inks for excellent rendering of black and white images. The slides also really need to go into better storage boxes, which I'll eventually order from Archival methods. Wow, that's quite a colorful wedding dress! Amby looks so young! And my father does too, of course. I think he was 25 when he married my mother. That seems young to me; I was 34 when I got married in 2001. 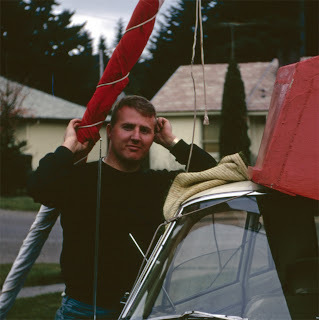 I have about twelve dozen slides remaining to examine. Here is a mystery box. I'm coming across people and places I don't recognize. 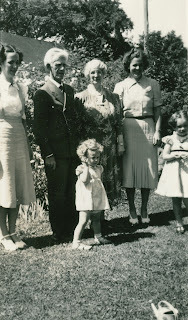 Does anyone recognize these people and/or places in this batch?